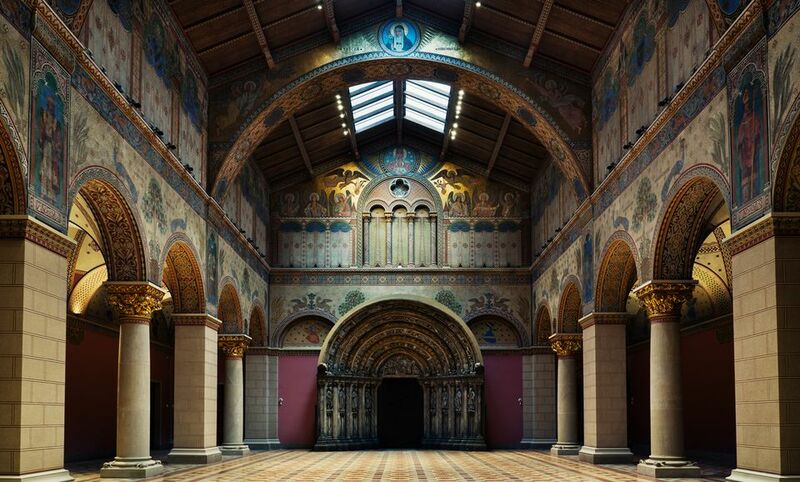 Severely damaged during the Second World War and closed to the public for more than 70 years, the Romanesque Hall at the heart of Budapest’s Szepmuveszeti Muzeum (Museum of Fine Arts) will be a highlight of its reopening tomorrow (31 October), following a three-year restoration. The total cost of the renovation was around €40m. Built during the early 1900s, when the Hungarian half of the Austro-Hungarian monarchy was seeking to assert its national pedigree, the museum houses a large collection of European art, including masterworks such as Raphael’s Esterhazy Madonna (around 1508), Giorgione’s Portrait of a Young Man (around 1508-10) and The Sermon of Saint John the Baptist (1566) by Pieter Bruegel the Elder. Decorated in the style of a Romanesque basilica, with depictions of important figures from Hungarian history, the hall is the most ornate section of the ground floor. However, it languished for decades as a storage area until restoration began in February 2015. The project involved almost 70 conservators, employing techniques usually reserved for Romanesque churches. The hall and a series of new basement spaces will open on 31 October, with the rest of the renovated museum due to be unveiled by mid-2019. To mark the 500th anniversary of the death of Leonardo da Vinci, there will be a special temporary display around the museum’s 16th-century bronze statuette, Rearing Horse and Mounted Warrior, attributed to Leonardo (until 6 January 2019). The show will explore the technical challenge of creating a large-scale rearing horse and rider, with drawings by Leonardo and sculptures by other Renaissance artists. The reopening is part of a wider reshuffle for Hungary’s national art collections, backed by Viktor Orbán’s populist Fidesz government. For the first time since 1957, Hungarian work will now be exhibited alongside contemporaneous European art, with the Museum of Fine Arts focusing on the period before 1800. The ambitious Liget Budapest Project will build several new museums in the City Park, with art after 1800 eventually moving to the New National Gallery. While the decision to show Hungarian work in an international context has an artistic basis, observers will be wary of any signs that nationalist politics is beginning to influence museums.